These decorative gel Fire Columns are the ideal centrepiece for outdoor summer entertaining. Handmade of stone compound and accompanied with decorative river rocks they burn Paramount Gel Fuel 100% clean and odourless., which can be purchased separately. This beautiful garden burner has double walled tempered glass for long lasting durability. They can be used on any surface and can be easily extinguished using the included snuffer tool. Perfect item for outdoor décor and functional heating! No smoke, 100% clean burning. This Broil Chef PRO-SERIES Built-In LP Gas Grill comes with four high-powered, cast stainless steel burners that produce 87,000 BTUs of grilling power. The 40-inch grill offers a total cooking area of 870 square inches (includes the warming rack), halogen lighting mounted on the interior canopy, and a hood with a heavy-duty thermometer to help cook foods perfectly every time. Enjoy the warm glow of a fire while dining with the Cane Estates 5pc Woven Aluminum Balcony Height Dining Set with Gas Fire Pit Table Top. The Cane Estates Dining Set will invite excitement and class onto your patio or deck. The table includes an Ultra Stone table top with a square burner and windshield in the center as well a Woven Base Cabinet underneath. The table's base will hold and protect a 20 lb. gas tank (not included) as well the control panel for easy operation. The set includes four Woven Back Swivel Balcony Height Chairs with thick Seat Pads in a beautiful sand colored fabric to provide elegance and comfortability. Enjoy, style and comfort with your new Cane Estates 5pc Dining Set. Feel the ambiance of cottage life while enjoying the warmth of an open fire with the Napoleon Muskoka Patioflame Table Series. Coming in both square and rectangular shapes, the cast aluminum frames make these tables lightweight and along with the all stainless steel burner construction, incredibly durable. Never worry about the weather, drainage holes in the stainless steel burner pan allow the rain to drain away, and the optional Windscreen kit protects the flames. Safe and fuel efficient, the Muskoka Patioflame Table Series features a Thermocouple valve that cuts the gas when the flames are interrupted by wind. Embrace the cottage lifestyle. Gather around with your family and friends beside the warm radiant heat of Napoleon's Victorian Square Patioflame table. The Victorian is constructed in rust-resistant aluminum for lightweight mobility and weather resistance. The rustic bronze finish and ornate details provide a feeling of imperial luxury in your backyard. Each model features a topaz glass ember bed for beautiful flame reflections and other coloured glass kits are available for further customization. A single panel door provides easy access to a propane tank and a natural gas conversion kit is included. 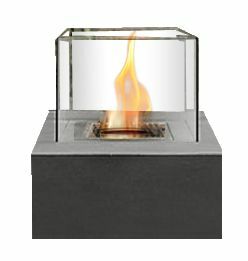 Square Concrete Garden Burner These decorative gel Fire Columns are the ideal centrepiece for outdoor summer entertaining. Handmade of stone compound and accompanied with decorative river rocks they burn Paramount Gel Fuel 100% clean and odourless., which can be purchased separately. This beautiful garden burner has double walled tempered glass for long lasting durability. They can be used on any surface and can be easily extinguished using the included snuffer tool.